Joshua Muheim: "Developing with accessibility in mind is fun and satisfying"
The next Frontend Conference Zurich is approaching fast. FEC talks to the hosts of this year’s workshops, here Joshua Muheim. 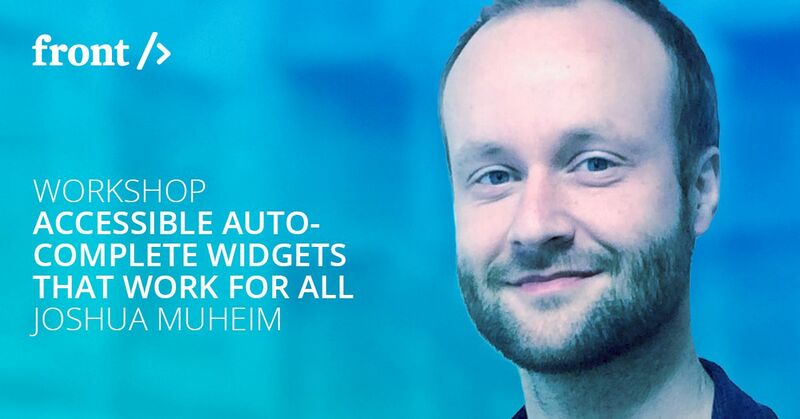 You can sign up to his workshop Accessible autocomplete widgets that work for all here. FEC: How and why did you make accessibility your thing? Accessibility offers a unique and distinctive way to improve the quality of frontend code by including the semantic layer: it reveals whether code is meaningful and coherent on the information level. This ensures that a website’s provided content is digestible by all kinds of users (regardless of their physical abilities), and even by automated services like search engines. Unfortunately, today’s websites are created with a strong focus on visual and interactive gimmickry. This often results in quick and dirty, bulky HTML, lacking the quality requirements described above. Furthermore, the semantic layer usually suffers a lot from this, negating the very origin and goal of the internet: sharing information, worldwide, between any individual. By taking accessibility requirements into account, we not only reach a bigger, more heterogeneous target audience; we also strive for high quality frontend code that is easy to handle by both consumers and developers of websites - a win-win situation. Not to forget that gimmickry is still possible on top of that! So promoting accessibility is my attempt to make this world a better place for everybody. What would you like to see happen in the near future with regards to accessibility? Internationally, legal requirements about accessibility are enforced more and more. Still, there are only very few reliable sources that provide the necessary knowledge to developers so they are able to create accessible websites. The «Accessibility Developer Guide» (launched a few weeks ago, see www.accessibility-developer-guide.com) is our foundation’s attempt to fill this gap. We hope that a vivid international community will gather around this Open Source project, offering a public forum for discussing accessibility requirements and creating real-world example solutions in a communal effort. Apart from this, I hope to see developers more and more acknowledging the potential and meaningfulness of adhering to accessibility techniques and paradigms. This way, the perception of accessibility will hopefully switch from often being a nasty, unpredictable challenge with little profit to being a reliable and powerful everyday tool that does a lot of good for everybody (and is even fun working with). What is stopping people from creating accessible autocomplete widgets? The biggest group (I suppose) simply does not know about accessibility, forgets about it or neglects it. Another group trustfully tries to add basic (or even advanced) accessibility features. But due to the non-homogeneous support of screen readers and browsers regarding interactive accessibility patterns, usually only a small part of potential users will benefit from them, while others are excluded and usually cannot use the widget (and the functionalities behind it) at all. What would be the one key takeaway you hope to give to the audience at the 2018 Frontendconf workshop? Developing with accessibility in mind is fun and satisfying. And thanks to the guidance of experts (like the «Accessibility Developer Guide»), a serious web developer will quickly manage to enter the topic and feel at home soon. What place(s) do you particularly enjoy in Zurich and why? The riverside of the lake (especially the meadow in front of the Chinese Garden), the ImpactHub’s locations, and the Irchelpark.